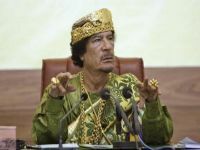 http://english.pravda.ru/images/arti...6/0/44860.jpeg Analysing the speech of Muammar al-Qathafi last Friday to the packed crowd in Tripoli, we can see how the Libyan Brother Leader thinks. Here is a summary of the speech with some comments, for our readers to see the other side of the story. And there is another side, as the mainstream media are starting to see. NATO committed a huge mistake.